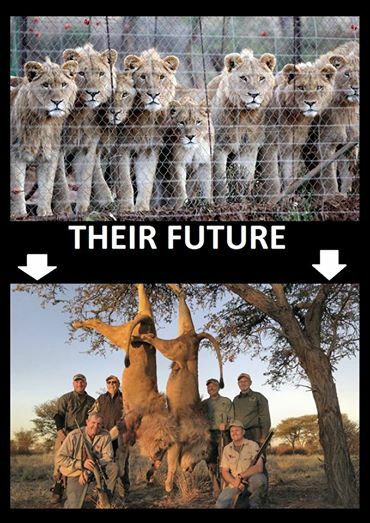 CACH (an acronym for Campaign Against Canned Hunting) is a grass roots organisation run entirely by unpaid volunteers. Founded by Chris and Bev back in 2000 while they were running a wildlife sanctuary in the Kalahari, the campaign was founded by the life saving of he Founders. It was not until 2007 that the campaign became structured into a formal non-Profit organisation, for purposes of fund raising. Even so, CACH remains a volunteer group. There is no hierarchy and no one draws a salary. 2. analyse and gather information on all aspects of canned hunting, including legal socio-economic, political, financial, forex, agricultural and veterinary factors. 3. prepare and submit comprehensive input to conservation authorities such as US Fish and Wildlife, as well as political entities such as the EU Commission and the Australian Parliament. 4. raise awareness globally via the Internet and social media, and educating wildlife documentary film makers, as well as environmental journalists. CACH UK team member Paul Tully, together with some dedicated wildlife advocates Hazel Hoole, Kerrie Malandreniotis, Barry Eveling, Sue Stuart and Cathy Holland attended the South African Embassy in Trafalgar Square, London to hand yet another protest memorandum over calling for a ban to canned lion hunting in South Africa. This is the second protest on the London based embassy in 2014 following the Global March for Lions on 15th March. We thank 60 Minutes team of CBS News for their absorbing expose of the links between cub petting and canned hunting. Fifteen minutes of entertaining footage of Kevin Richardson with his lions followed by some profound exposure of the lies that lion farmers use to conceal their sordid, commercial activities. Watch 60 Minutes on Sunday, 30th Nov, on CBS news in USA to see the dramatic exposure of Lion Parks in South Africa that pose as sanctuaries. My name is Edward Bourke, I am 14 and I have set up an organisation to raise awareness about the declining number of lions in the wild and to support conservation. It’s called “Saving The Lion". The way that my organisation works is that through our website or on social media, people take the pledge to save the lion, by raising awareness and supporting conservation. 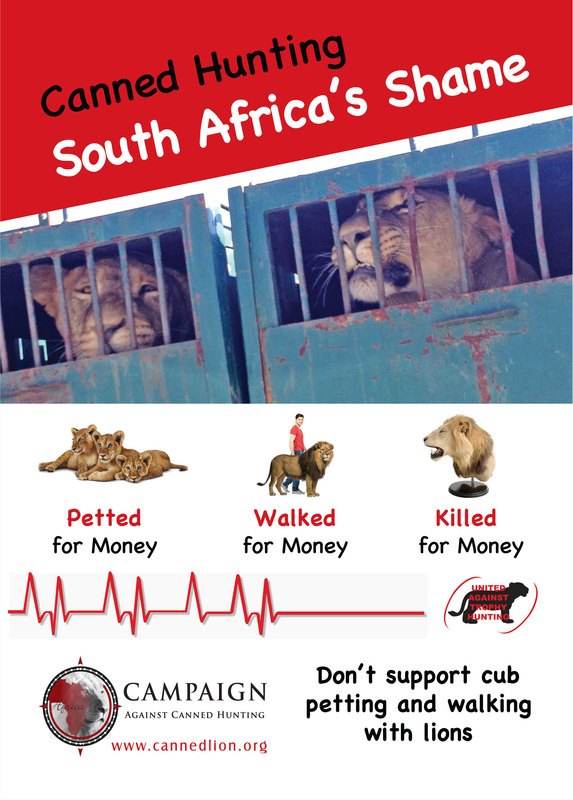 We will protest outside South African embassies worldwide and call for a ban to ‪#‎cannedhunting and cub petting in South Africa. Please add your city and let's make this big. No matter how big or small. Please contact us to be added to our organisers group for everything need and we will help you. Friday 13th March 2015. If your city has no SA embassy, please feel free in organising an alternative date ... JUST DO SOMETHING FOR LIONS. Thank you! along with information which you can use in your emails. There is no legal definition, but the absence of fair chase is key. There are fewer than 4000 lions left in the ’wild’ in South Africa, but more than 8,000 in captivity, being bred for the bullet or the arrow. Lion farming is a real threat to wild lion prides, for many reasons. The on-going capture of wild lions to introduce fresh blood into captive breeding, and the growth of the lion bone trade to Asia will impact severely on wild lions from poaching. This toxic and cruel industry needs to be closed down. Please read the report on a morning at Madrid Zoo by CJ & Luis on the CACHSpain page..
Read Malena's report and see all the terrific pictures on her day at the Horse Trials on our new CACHScotland page.. Very exciting new website www.knuffelfarms.nl by Dutch NGO SPOTS. Translation is easy into English, just right click on any page. CACH Scotland were at The Falkirk Charities Day. HOTLINE for reporting canned lion matters. Were you duped into volunteering at a lion farm that was posing as a wildlife sanctuary? Which national interests are threatened? 5. Our foreign currency reserves. 6. Our Fiscus – tax receipts. 8. Our tourism industry, and the jobs that come with it. 9. Our efforts to stop corruption. 10. Our efforts to transition to a more caring society from a violent one. THE LIFE OF A CAPTIVE BRED LION IN SOUTH AFRICA. From Cub Petting to the last day for a captive bred lion. Please educate yourself about the captive lion breeding business so that you can do the right thing. Did you know that there are an estimated 55,000 Jaguars left in the Central American jungles? And that lion numbers have collapsed to the point that there are only an estimated 25,000 lions left alive on the whole African continent now - and declining fast! Yet Jaguars and all other big cats are all listed on CITES Appendix 1 - except for lions, which can still be freely hunted because they are only CITES App 11. Now why is it, that although there are twice as many Jaguars as lions left in the wild, that Jaguars are specially protected against hunters, but lions are not? Surely, logic dictates that it should be the other way around. My own suspicion, knowing that conservation is controlled by the hunting industry is that Big Hunting was happy to have Jaguars put on CITES App 1 because who wants to go to a central american jungle and get bitten by leeches and mosquitoes? But, Big Hunting loves to hunt lions in pampered 5-star luxury safari lodges in the pleasant African savannah, so forget the numbers in the wild and screw the conservationists, Big Hunting will not allow lions to be raised to App 1. Am I being unduly cynical? This picture was taken on the N1 near Bloemfontein. Just another glimpse of the miserable lives of captive lions in South Africa. Formed by Chris Mercer and Bev Pervan for reasons related in their book Kalahari Dream, www.kalahari-dream.com CACH is an animal advocacy organisation. What is animal advocacy? Essentially, it comprises raising awareness, using all media to expose the evils and the cruelty. Canned hunting only exists because of a failure of government policy, and then it is ferociously defended by wealthy vested interests. Canned hunting can only be abolished by a sustained campaign to raise awareness, and to change policy. Then, an informed public must persuade US and EU governments to ban the import of lion/predator trophies. Only that way can the supply of dollars be cut off, and the industry closed down. All sources of income need to be challenged, especially cub petting, whereby lion farmers are able to externalise the costs of rearing their living targets. Also the extortionate fees charged to volunteers, who pay to work at lion farms in the naïve belief that they are assisting conservation. "I recently wrote a short essay of sorts for my personal blog on the subject as contribution to World Lion Day earlier this week -- http://bit.ly/1nKiT2p.)" This is a very good article and we recommend it.